Why do I do this? Some personal insight. Not long ago I was emailing back and for with my friend Amanda who was trying to do a little flipping herself. We both have museum backgrounds and I think I made a passing comment that by flipping, it taps into my inner conservator. We talked about how we both had once wanted to go into art restoration and conservation, but that meant too much science! As an undergraduate student I was an art history major and during a semester in Italy I took a class in art restoration. The professor said that artists who go into the field of restoration often have a hard time because their artistic desires and creativity often get in the way. That made sense. Rather than trying to restore a piece of art back to the the way it originally looked –the way Leonard da Vinci originally painted it, some would try to make it look the way THEY thought it should look, for better or worse. There is difference. While taking the class and thinking about that, I realized the advantage I had was that yes, I have artistic abilities, but I never thought of myself as an artist. I was always copying pictures and photos as a kid but when I tried to create something out of my own imagination it was awful! So I thought I would be great as a restorer/conservator…or forger! Unfortunately, as I said I discovered that to follow that professional path, I would need a lot of science and chemistry! YIKES!!! I never even took chemistry in high school so I knew I would pretty much have to start over again in a field I really don’t think I have any aptitude for. So I never did pursue that interest. Did I mention “un-scientific?” For anyone out there reading this who IS a conservator, please forgive for what I have done. 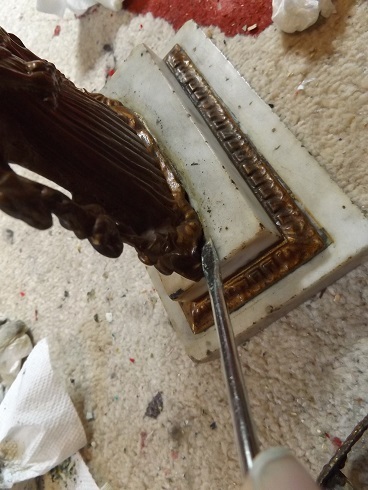 I obviously don’t have the correct training, tools, or cleaning materials to do this properly, so to scrape off some of the gunk that had accumulated around the base where the metal and marble meet, I used a flat head screwdriver. The marble could use more cleaning, but I didn’t know exactly what to use, so I just used a green product to clean it up as best I could. Marble is also much softer than I expected so I had to be careful in what I did so that I didn’t damage the it. 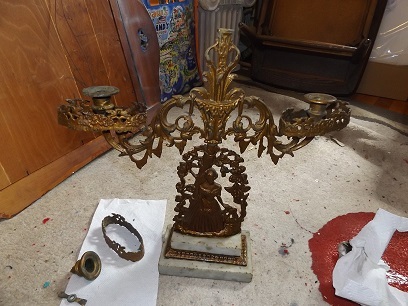 In terms of cleaning the metal, it could have used a good strong bath with some sort of chemical solution to get off the grime and layers of gold paint. Again, I just scrubbed the best I could with what I had. There are three pieces to set in place where the small candle holders would be screwed in. One of them, had the center piece broken off. It should have been soldered back on, but all I have is a strong glue. I’m pretty sure, if down the road a professional wants to tackle this piece than do so easily. One of the things I do know about restoration and conservation, is to make sure everything you do is reversible! Once everything was cleaned, as good as it was going to be, I looked at it a little closer and realized that there were small holes all around the three oval pieces. Of course!!! There had once been crystals hanging to catch and multiply the candle light and sparkle. So once I’d decided on the painting the piece blue, I had to replace the missing crystals with new ones. Rather than buying antique pieces or REAL chandelier crystals, I opted to make my own. In the end, I think the final result is quite pretty. 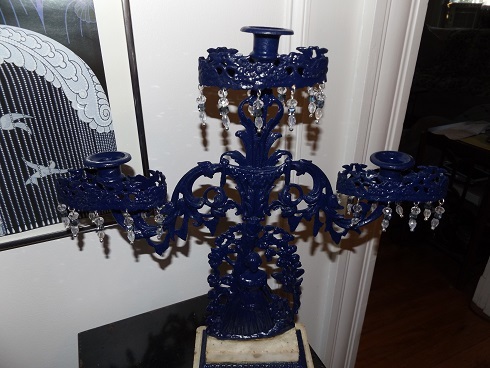 I know not everyone will want or need a navy blue candelabra, but the one person who does, let me know! I think the blue makes it more fun and somehow less formal. It would be great accent piece any room. 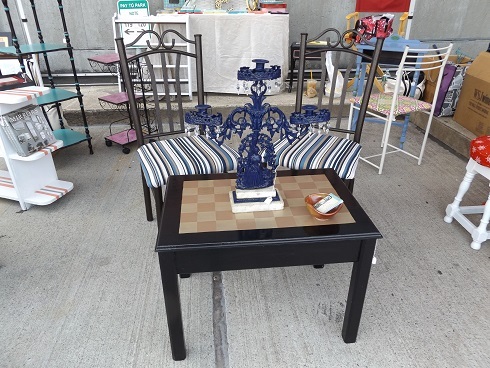 Here it is on display a the flea market. So in my own little way, I guess I did end up in restoration work. It’s my way of saving and keeping a bit of the past and history alive and beautiful a little bit longer. Maybe some one will keep one of my flipped pieces for a long time and pass it on to a friend or family member. Maybe some dec arts restorer will find it and redo everything I did. That’s okay, as long has it has life. I do dread the day when I see one of my flips at at thrift shop, or on the side of the road. Will I pick it up and give it life again?? Probably. I think I have a strong nurturing side that never really got to be used since I never go married or had kids. I can take care of and love my cat, and I can take care of and love the abandoned pieces of our lives. 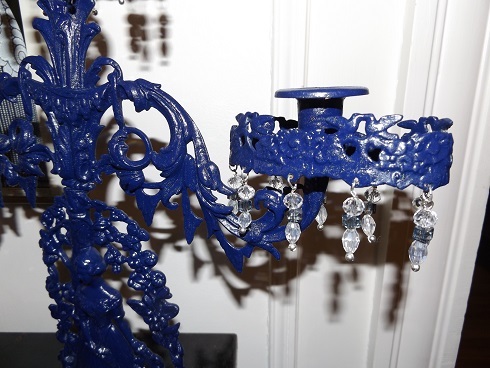 Everything wants to be wanted and loved, even a table or blue candelabra. Thanks Martina!! So glad to see you here! Love this piece of informative insight – now I know why I do the same type stuff! Thanks Victoria, I’ve been learning about myself as I do this! I hope you’re having fun with what you’re doing too.